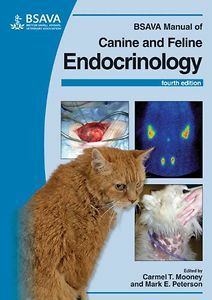 Over recent years several endocrine disorders, such as feline acromegaly and hyperaldosteronism, have become of greater importance and a range of new therapies have emerged that are now considered routine. emphasis on the common problems encountered in investigating and treating endocrine diseases. Unlike the previous editions, the Manual is divided into sections covering each endocrine gland as this is more traditionally used by endocrinologists. These sections cover the major and minor endocrine disorders of each species. A separate section deals with relevant presenting complaints in a problem oriented manner. This fourth edition provides a ready source of practical information for veterinary surgeons in general practice and will also be useful for undergraduate veterinary students, veterinary nurses and veterinary graduates embarking on further qualifications in small animal medicine. The international range of renowned contributors reflects the current globalization of tests and treatments for endocrine disease.